The Executive Committee below are responsible for the development and administration of Cuimhneamh an Chláir. All members of the Executive come from all across County Clare and range from diverse professional backgrounds including teachers, archaeologists, folklorists, historians and cultural and community activists. The committee was brought together by a shared dedication to the preservation and promotion of Clare’s cultural heritage. We are an entirely voluntary and independent group. Our Cuairteoirí come from all across County Clare and were selected according to their dedication and commitment to the ethos and objectives of Cuimhneamh an Chláir. 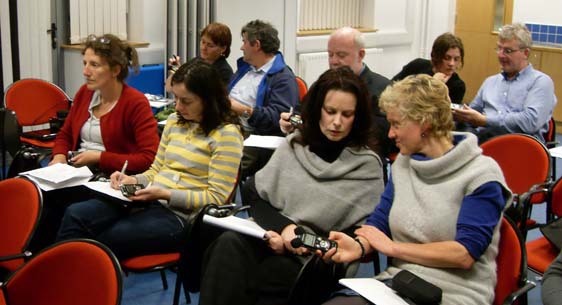 All Cuairteoirí have undergone training on the theory and practice of folklore and oral history recording and receive regular training on additional dimensions that assist in the collection of oral heritage. The following in addition to the Executive, are the Cuairteoirí of Cuimhneamh an Chláir. The Chicago project was ran between March and April 2010 and involved a collaboration between Cuimhneamh an Chláir, NUI Galway and the Irish Immigrant Support Group in Chicago. To ensure that Cuimhneamh an Chláir develops according to best practice and achieves maximum results, a special non-executive Advisory Board has been assembled. The latter contains representatives from the leading folklore and oral history, educational, cultural, academic, media and Age orientated institutions throughout Ireland, as well as relevant local stakeholders.